The familiar red rock landscape of Moab had already morphed into a dry sandy desert before I turned off pavement and onto the dirt just south of I-70 near Green River. I was headed into the unknown (for me), on a journey about exploration and discovery in strange but beautiful landscapes kept wild by their inaccessibility. I had chosen to make a solo trip into The Maze, the most remote part of the Canyonlands national park, to challenge my skills and work out a number of different scenarios related to the contingencies of a remote expedition, unsupported and off-the-grid. And I selected a route via the San Rafael desert that would present a few navigational challenges amidst criss crossing trails in harsh desolate terrain. 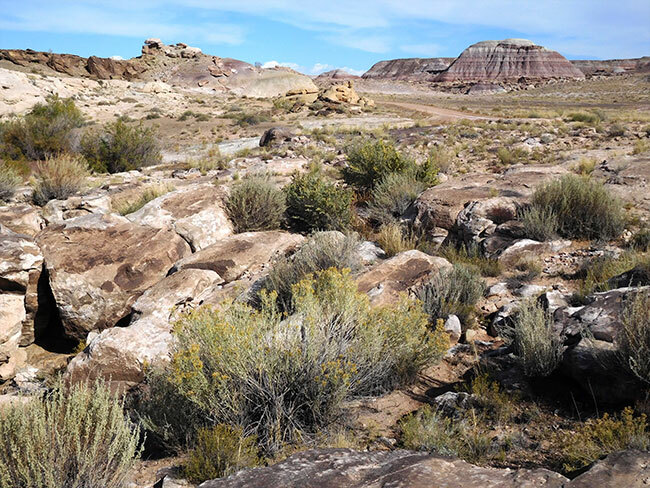 The San Rafael desert includes about 2,000 square miles of public land administered by the BLM, centered on a geological feature known as the San Rafael Swell. The Swell consists of a giant dome-shaped anticline of sandstone, shale, and limestone that was formed some 60-40 million years ago. I-70 goes right through the center of it, dividing the desert north and south, and the area is full of scenic sandstone formations, deep canyons, desert streams, and expansive panoramas. My route only crosses the very smallest southeastern corner of it, but passes through several different types of terrain. As I moved south on a nicely graded dirt road and away from “civilization” I felt a heightened sense of situational awareness seasoned with a touch of excitement. Everything was “new.” There was also an element of nervous concern. Recent heavy rains may have washed out sections of the “road” and I might have to turn back at some point. But for now it seemed the long drive southward would continue on straight and flat with no navigational issues in this first section, as there was only this one dirt road. The terrain was typical desert, with bare sandy earth, punctuated by sparse green plants and dry hills. Just as I began thinking to myself that the drive down might get a bit boring, the trail dipped to reveal strange shaped hills in the distance. At first I thought it was some kind of construction site, then as I got closer I could see that it didn’t seem to be an excavation or a man-made dirt pile, but was some kind of naturally occurring form. I stopped briefly to explore this otherwordly landscape. At the base of these hills the outcroppings were some kind of white stuff. The texture kind of looked like cement (to my urban eyes) or perhaps some kind of coarse salt. It was hard to tell if it had been “piled up” or just happened to be there. 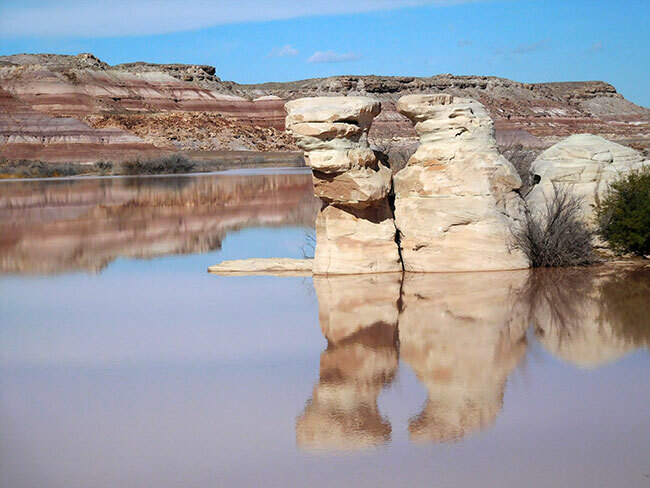 According to the Southern Utah Wilderness Alliance, the area of the San Rafael Swell is a microcosm of the entire Colorado Plateau, with a concentric series of rock formations from different geological eras, shaped by uplift and erosion. Its stark and dramatic scenery stems from spectacularly exposed sedimentary strata. Each rock formation has created its own unique world. I am just seeing a tiny sample of it here. Far beyond this little corner of the desert, there is much more to explore. Colorful Entrada Sandstone forms the brilliant orange cliffs and towers of Cathedral Valley, Salt Wash and the hoodoos of Goblin Valley. 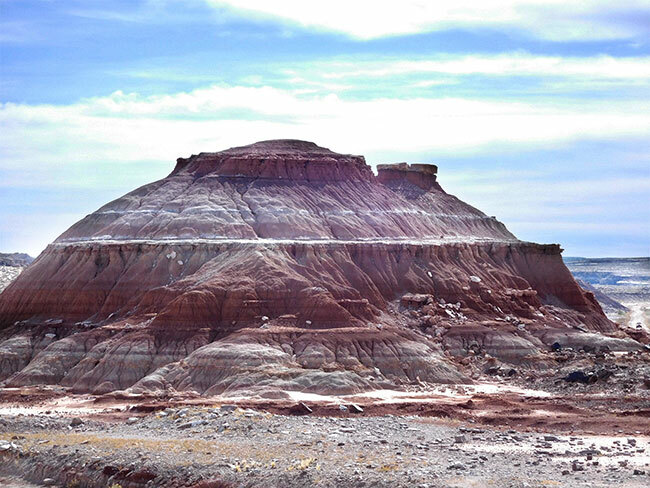 There are psychedelic badlands of the Morrison Formation, an intricate “painted desert” and dark volcanic mountains. But the magical landscapes would have to wait for another time, if I wanted to get to The Maze. 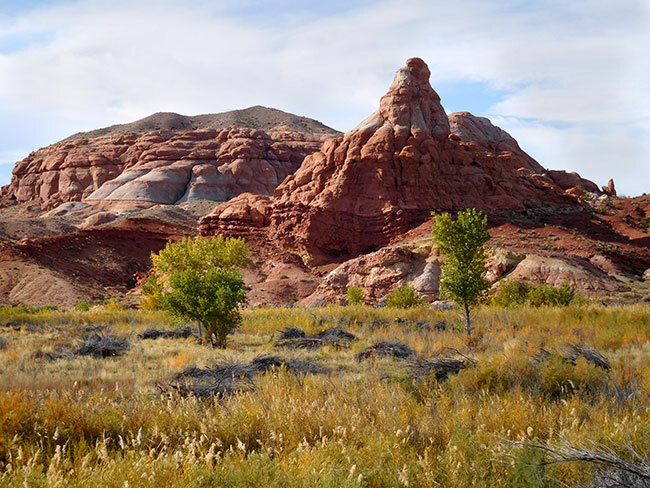 I continued moving southward following the trail as it passed through colorful hills that reminded me of the “Painted Desert,” and the terrain began to get a little wilder looking. Approaching an area on the map called Horse Bench Reservoir, I could see water shimmering in the distance. It was not a mirage. There was suddenly a vast lake in the middle of the desert. It was breathtaking. The painted hills reflected in the mud colored water while rock pillars protruded like cypress stumps in a swamp, as if this was some weird parallel universe. I was lucky, because while the recent monsoon rains had pushed the water level up and clearly flooded some areas that were not usually underwater, the road remained passable for the Jeep. I continued my journey south, and the navigation got a little more complicated as intersecting roads and turnoffs started connecting with my trail. Still, the “main” road was pretty obvious, and I drove on into some more rugged desert for a stretch before reaching the San Rafael River. If I’d had more time to explore, there is a nice hike in a non-technical slot canyon at Moonshine Wash a bit further south. 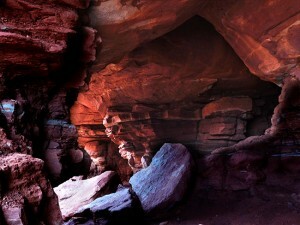 I’ve been told the hike is relatively easy, with spectacular scenery, interesting history, and some cool artifacts. Apparently the area was popular with bootleggers during prohibition and it is possible to see the remnants of old stills around there. I put that on my “to do” list for next time. My route turned to the east and then again southeast, and along the way in the middle of what seemed like “nowhere” there was a grave marker. I later learned that it was for a 64-year-old road worker, Charles Watterson, who was shot at this spot (referred to in the news article as “Robbers Roost”) by a man who was hiding behind some rocks (and did apparently steal some money from the deadman, making the place name factual). This happened in 1998. On the map it seems that the actual “Robbers Roost” area is further south, but I imagine that it was never quite specifically delineated. Sandwiched between the Colorado River, Green River, and Dirty Devil River, the inhospitable terrain crisscrossed with steep-walled canyons and hidden ravines received its colorful name in the 1870s when an outlaw named Cap Brown ran stolen horses through the area. 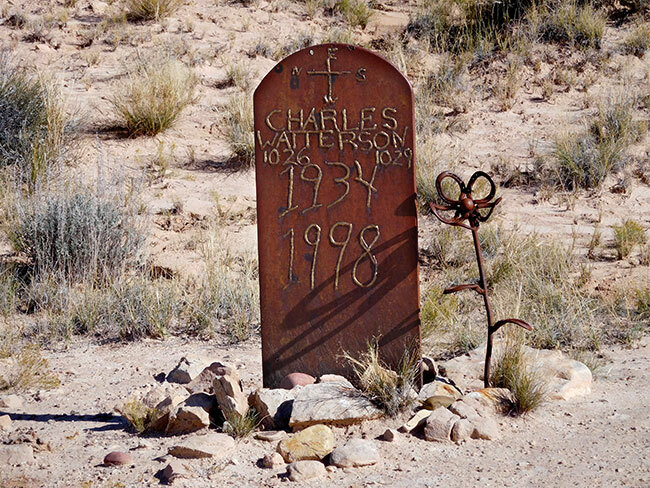 But the area’s most renowned “resident” was Butch Cassidy, who began to use the Roost in the 1880s. Robbers Roost afforded hundreds of hiding spots, was difficult to penetrate, and became one of several hideouts along the “Outlaw Trail.” Despite some sporadic attempts, the authorities never successfully penetrated the refuge. It gained a reputation as being impregnable, and stories about its defenses contributed to its legend. 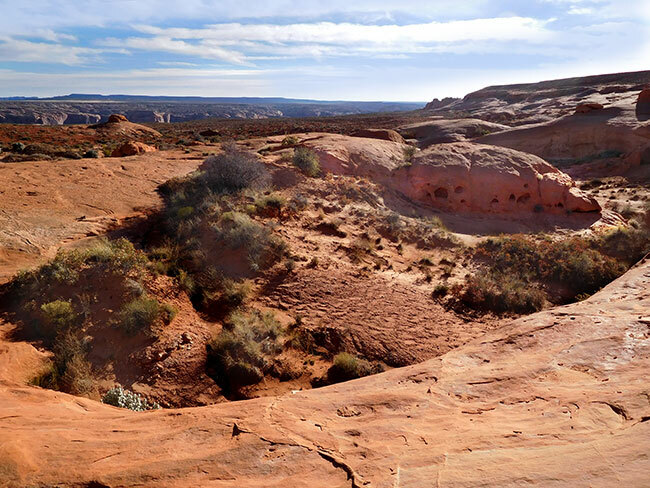 According to Utah Adventure Journal, the last 45 miles of trail into the Roost required a thorough knowledge of the terrain because water for horses could only be found in one place. The Roost was largely abandoned as an outlaw hangout after 1902 when Butch Cassidy and the Sundance Kid departed for South America. My route continued due south once I crossed the San Rafael River (where there is a paved bridge), and I could see the La Sals to my east. The mountains were like a welcome beacon shining across the desert constantly reassuring me I would not get lost–as long as I could see them I would always be correctly oriented without reference to a compass or a GPS. From this vantage point I could see several distinct terrain types between myself and the mountains. 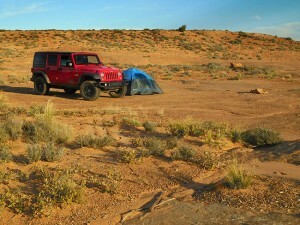 I was nearing my “destination” for the day, a spot I had chosen just north of Horseshoe canyon that seemed like it would present some scenic camping possibilities. 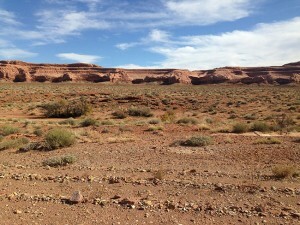 The terrain was changing a bit too, with more of the familiar red rock popping up here and there. I turned east off the main trail a little beyond Lookout Point, heading for Keg Knoll. Though the terrain looked flat at first, I soon saw something seeming to rise up out of the flatness on the trail ahead. As I approached it, the terrain began to change character again, showing its rougher more desert-like side. The “knoll” itself was a rocky outcropping, and the wind was blowing harshly across its face. It didn’t seem like the heights would be a good place to camp at all. It was exposed and open, and the wind was picking up. I drove a little further along, until I came to a spot where I saw tracks pulling off to the side, and followed them down into a more protected “bowl”-like area on the other side of the “knoll.” The terrain itself was smooth flat rock and the view was beautiful. There were a few old fire rings scattered around and I decided to make camp somewhere nearby, though the wind was getting worse. I had chosen Keg Knoll as my camp spot without ever having seen the area, based on research, maps and other people’s trip reports. I had wanted a camp location close enough to the park entrance so that I would not have a long drive tomorrow, but I wanted to be on BLM land where wood fires were permitted, and in a general area that would bring me through some navigational challenges. I also wanted to be somewhere beautiful and interesting for this first night out under the stars. From what I could learn prior to the trip, Keg Knoll fit those requirements. One of the big challenges of this trip had been planning the route through such a remote area in an unfamiliar part of the country. 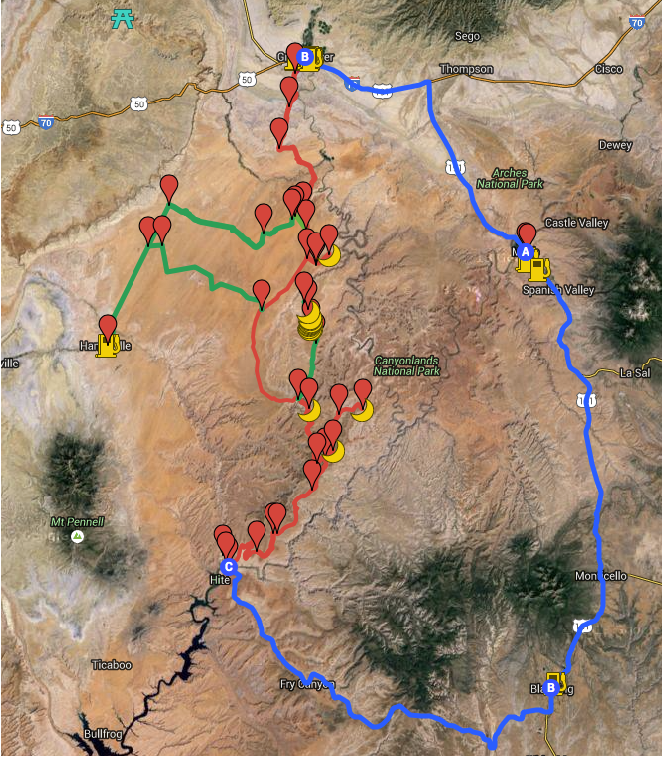 While the actual segment within The Maze was relatively straight forward to plan with all the information about distances and campsites available on the Canyonlands national park website (supported by a system for obtaining permits that reserved exact sites and dates), planning for the segments outside the park was more complex. I created my route referencing different maps and anecdotal research online, picking out potential campsites ahead of time so that I would have some kind of “endpoint” at a reasonable day’s driving distance. Of course, I could always change my mind if I saw a great spot somewhere else, but in the worst case scenario I wouldn’t find myself searching for a place to camp as the sun was setting in terrain that was not ideal. I also prepared optional routes for some segments of the journey, so I would have a “plan B” ready to go in the case that my original choice of route proved impassible or impractical. This was an important safety factor for a trip with fuel management considerations and a tight time frame. With the wind blowing harder, I took a walk around to try to find a protected spot to put my tent on the east side of the Knoll between the heights and a small ridge. There were lots of little “bowls” full of plant life, with sweeping flat stone around them. 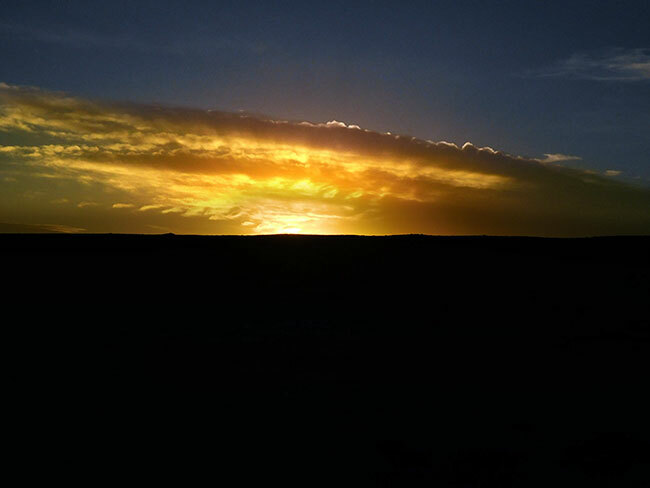 It was another otherworldly landscape and I was enjoying the impromptu hike after a long day in the Jeep. 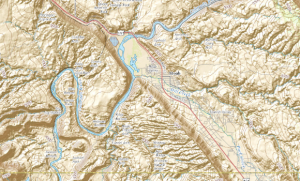 From what I had learned, there are some great hikes to be done right near here, with some unusual features including something called “the dragon’s teeth” near Colonnade arch. I wouldn’t have time for that this trip, but am adding it to my list for next time. Just wandering around exploring the terrain near camp had taken me much further than I expected and reminded me that distances in the desert can be deceptive, especially when I keep getting distracted by interesting details that have me zig-zagging in random directions. 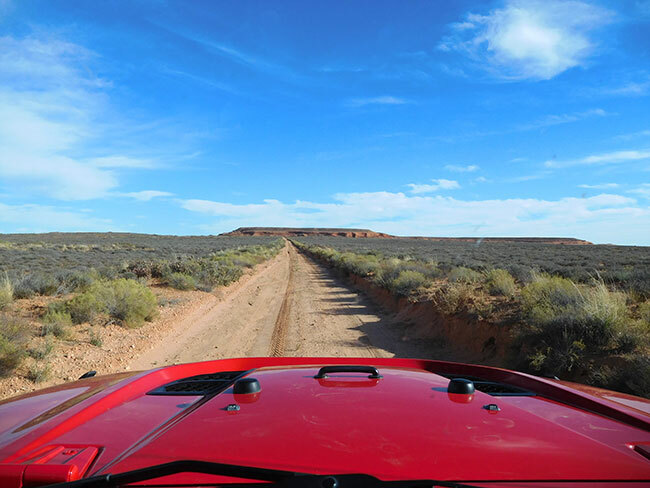 Turning back towards the Jeep, I was glad it was bright red and easy to spot in the desert. The sun was getting lower in the sky and I didn’t have that much time to get settled in. Deciding on a spot that was a bit hidden and protected, I pulled the Jeep in to block the wind as best I could and quickly set up my tent, weighing it down with my extra water bottles and bundles of firewood. Another complication for a trip so far from “homebase” related to the limits it imposed on my equipment options. Because I had to fly into Utah initially, I had to pack everything in luggage that met the airline’s size and weight requirements. I was limited to one bag, not to exceed 62″ (157.48 cm) in overall dimensions (length width height) or 50 pounds (22.68 kg), so taking my favorite tent was not an option. I needed something much lighter and more compact but with more room than an ultralight backpacking tent. My compromise choice was to purchase a cheap tent that weighs under five pounds but is large enough to spread out and take shelter in. Though far from the “ideal,” this “disposable” tent has held up to the rigors of some fairly rugged camping in high winds before, and would perform well during this trip too. The last rays of the sun were turning the landscape to gold as I finished setting up camp and sat down to take in the magnificent sunset. 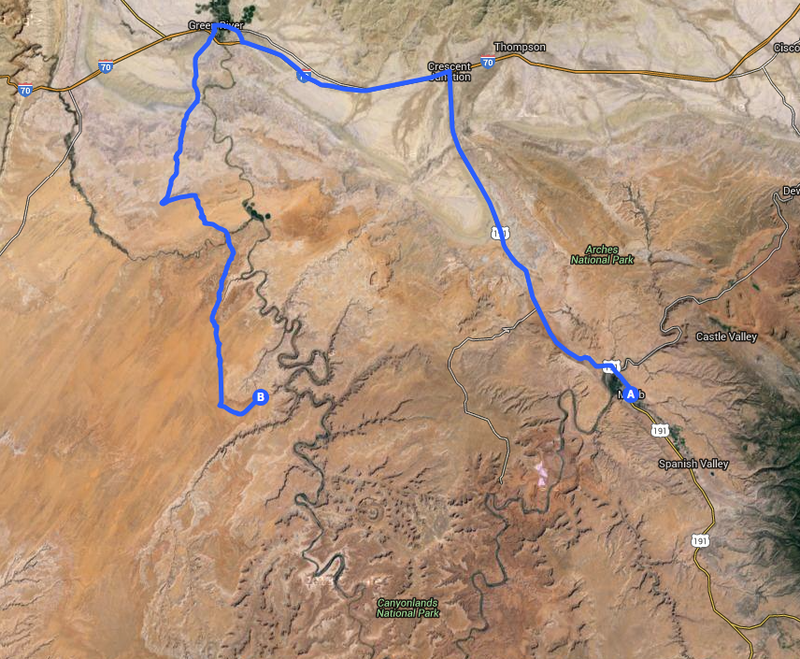 Starting from Moab with a full tank of gas and two five gallon gas cans additional, I head north on Highway 191 to Crescent Junction, then take I-70 West to Green River. 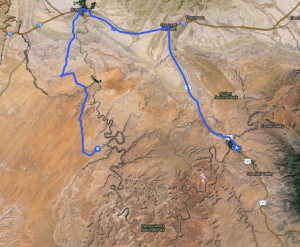 I top off gas again at Green River, then say goodbye to civilization as I move on to dirt, heading south through the San Rafael desert to a spot called Keg Knoll, not far from Horseshoe Canyon. The road is maintained and until the turnoff for Keg Knoll, is quite a major artery, so the driving is easy and smooth through varied desert terrain. 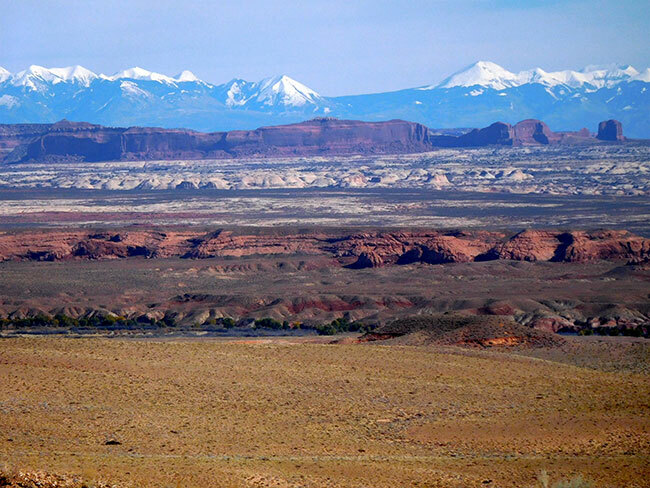 Much of the area around the San Rafael Swell is remote and aside from Interstate (1-70), is mostly undeveloped with only old uranium mines, dirt roads and some simple recreation facilities. 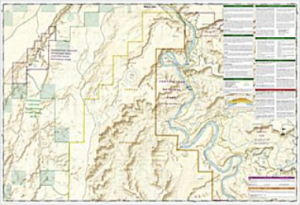 The BLM advises visitors to bring maps, as many roads are not signed. Motorized vehicle usage is limited or prohibited in certain areas (see the Emergency Road Closures for current information). 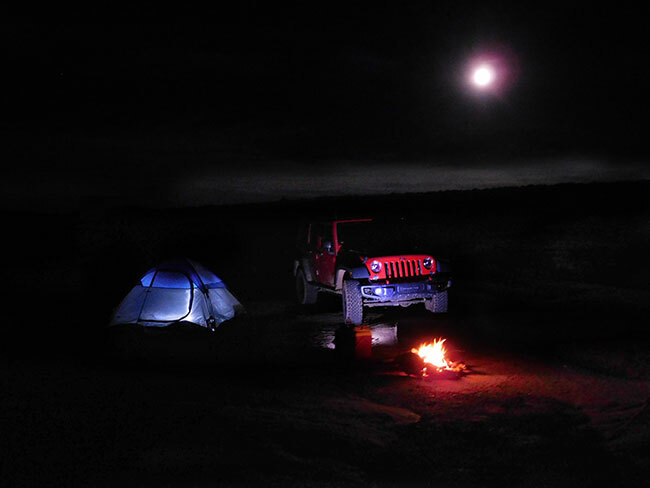 Additionally, the BLM reminds those traveling in the desert of some basic safety precautions: Never camp or park your vehicle in a wash or stream bed and avoid hiking in narrow canyons when rain is a possibility. A dry wash can flash flood in a matter of minutes even if you don’t see a cloud in the sky. Many roads within the Swell cross soil types that are extremely muddy after storms and during periods when snow is melting. At such times, these roads become virtually impassable. Obtain a long-range weather forecast before traveling into the area. There are very few sources of potable water in the San Rafael Swell, so make sure to carry at least one gallon of water per person per day. Exercise extreme caution when exploring around old mines. Besides the danger of being caught in a collapsing tunnel or falling into a hidden shaft, heavy concentrations of radioactive radon gas are known to accumulate at the entrances to old uranium mines in this area. Note that no permits are required for individuals and small groups for non-commercial use. For more information contact the Bureau of Land Management’s Price Field Office at 435-636-3600. Just getting here had presented some challenges of its own. For someone coming from outside the local area the trip requires careful advance planning and preparation. In addition to obtaining the necessary permits to camp in the Maze district, thought must be given to routing in and out, fuel management, safety precautions, weather and equipment. The area’s remoteness requires a level of self-sufficiency and the ability to “self-recover” should a vehicle breakdown or get stuck. 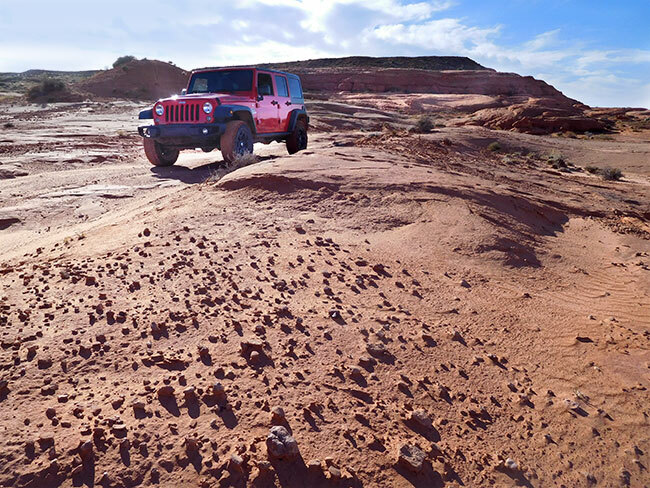 The National Park Service reminds visitors that a high-clearance, low range, four-wheel-drive vehicle is required for all Maze backcountry roads and discourages inexperienced drivers from attempting these routes. 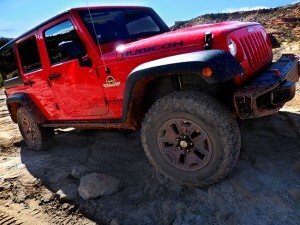 Additionally, they suggest that all drivers carry at least one full-size spare tire, extra gas. extra water, a shovel and a hi-lift jack. 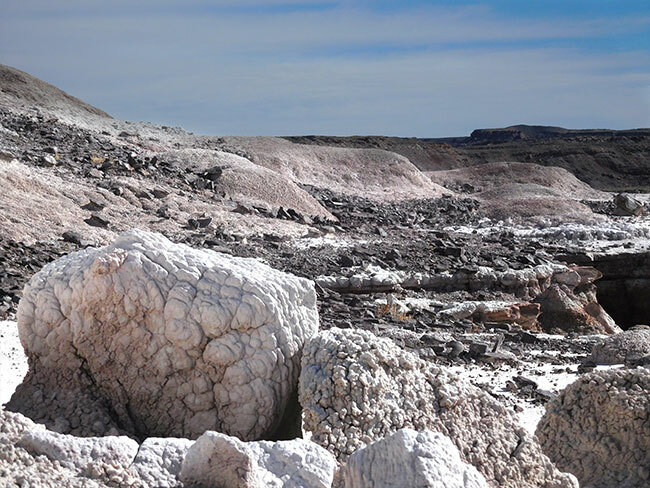 The story of the San Rafael Swell’s unique geology begins roughly 250 million years ago in the Permian period, when it was a seashore. 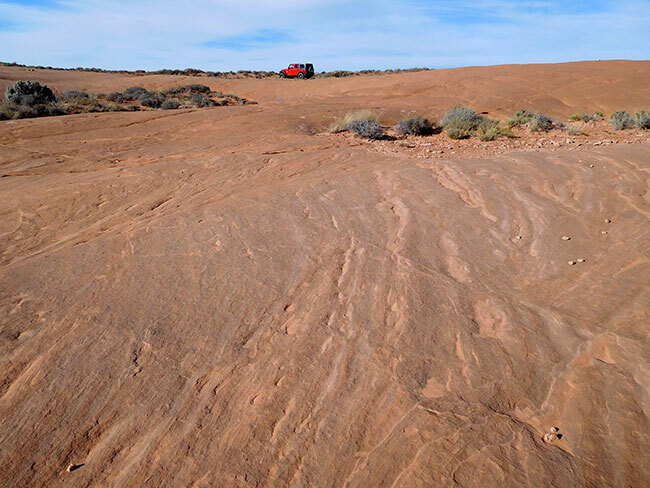 Layers of sandstone were deposited as beach dunes piled up, forming Coconino Sandstone, a rough irregular stone with cross-hatching and variable hardness that forms small fins and ledges as it erodes. The Coconino was covered by a layer of limestone when the ocean overtook the shore. This Kaibab Limestone is a thin layer very resistant to erosion that forms the base of many of the flat open areas in the upper San Rafael. 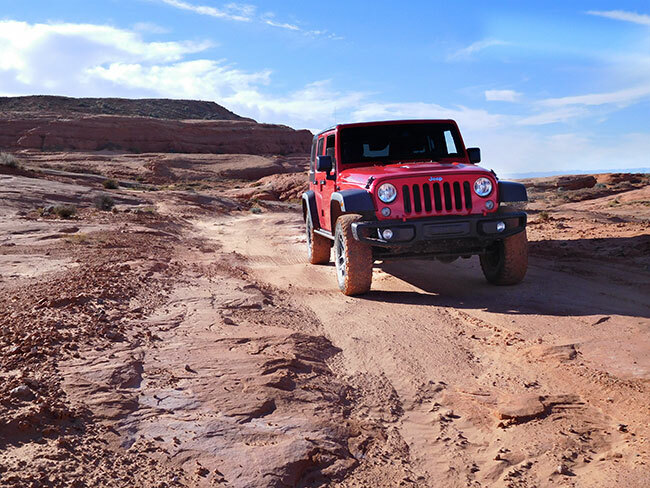 NOTE: This is the first in a series of segments highlighting details of a solo Jeep trip into The Maze district of Canyonlands national park, in Moab, UT. All text and photos are copyright JoMarie Fecci/USnomads unless otherwise noted. If you would like to use any imagery here, please contact us for permission. The trip was conducted in October 2015 by JoMarie Fecci of US Nomads. For more information about the specifics contact us.